Super Savings Item! 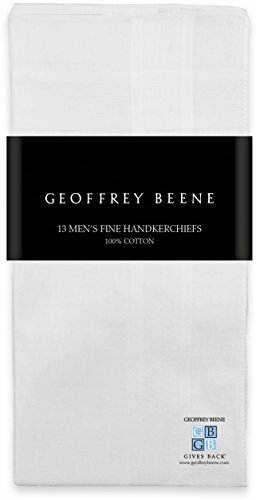 Save 34% on the Geoffrey Beene 13 Pack Men's Fine Handkerchiefs 100% Cotton White by Geoffrey Beene at Toad Lily Press. MPN: 43230-4122. Hurry! Limited time offer. Offer valid only while supplies last. Geoffrey Beene Function and Fashion meet in this 13 pack of white handkerchiefs that feature a solid design. They are made of 100% woven cotton. A Great Gift for Any Occasion - Perfect gift for gentlemen, grandfathers, fathers, dads, or anyone who enjoys a classic hankie.